The residents seem a little dour and confused by the change in their surroundings. The wind has stopped. Their once pristine creek has turned a sludgey brown. One resident claims she got dizzy and once she came to everything was different. You’ve certainly noticed the changes in landscape on your way here. If you claim expert status in your journey now you’ll get a bit of advice from the Beginner’s House rather than being swiftly escorted to the door. The green-haired bouncer lady explains how two jobs work, mimes and freelancers. What is a mime and where do you get one? That crystal shard in Walse Tower that you couldn’t reach contained the mime class. You will be able to rescue it from its watery resting spot soon at the Sunken Tower of Walse. Mimes aren’t like other jobs in that there’s only one ability to learn: ! Mimic. Mimes copy the actions of whatever character went prior to their turn, so they’re quite versatile. In addition, they do not have the standard Fight and Item commands on the battle menu, leaving you a total of three open slots for customization. None of the shops sell anything different, unfortunately. Tule doesn’t seem to hold the answers to what has happened to the area and whether Exdeath has been defeated. 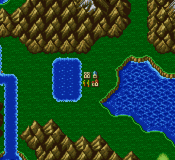 It’s time to press further and see where Galuf is leading you.